For the third time in this term of office, the Montgomery County Council is trying to quietly ram a major change in the law through behind closed doors in Annapolis. In 2015, they tried to establish an Independent Transit Authority with unlimited taxation and debt power, and in 2017, they attempted a backdoor runaround the term limits voters had approved only months prior. 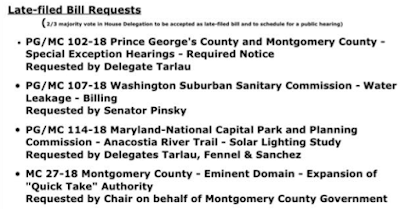 This morning, they are exhorting the Montgomery County delegation to the Maryland General Assembly to expand and increase their eminent domain authority. The bill, like the others, is being filed at the eleventh hour, and with no fanfare. Bill MC 27-18, "Eminent Domain - Expansion of 'Quick Take' Authority," would streamline the property seizure process related to highway and transit projects. For example, it would eliminate the ability to compare a property to similar pieces of land for the purpose of determining fair market value. The Council would also be able to force residents out of homes, and businesspeople out of commercial properties immediately, as long as they make an immediate payment of that potentially less-than-actual market value to the landowner. Purple Line opponents suspect the law may be used in short order for eminent domain seizures related to that light rail project. That would fit the "heckuva rush" manner in which it is being put forward in Annapolis. But looking ahead, this law would be equally handy in the quick demolition of more than 150 homes and businesses along Georgia Avenue between Olney and Wheaton, for the planned BRT route there. We know that from a state analysis, but we don't have similar numbers yet for which properties would end up being seized for BRT along MD 355 and Route 29. How might this also be used in the Veirs Mill Corridor sector plan, which is about to begin the process of approval before the Montgomery County Planning Board? Land seizures along Veirs Mill have been strongly hinted at by planners. The late-filed bill will be introduced at the 9:30 AM session of the Montgomery County Delegation this morning. If the bill receives the necessary votes to advance, a public hearing will be scheduled. One question will be: will that hearing be held in Rockville, or Annapolis? It's no wonder they held this bill from you, despite planning it for months, and are now attempting to file it quietly at the last minute! Dyer conveniently omitted mentioning that this is a constitutional amendment and as such requires "submitting this amendment to the qualified voters of the State for their adoption or rejection." That text is actually right at the top of the bill. Kinda kills Dyer's whole narrative, doesn't it? The MoCo council can't be trusted to protect citizens. Their primary concern is expanding their tax base at the expense of quality of life for residents. They want more, more, more. More people = more development, more traffic, more crime, lower life quality. 10:18: Proof positive that you're working for the MoCo cartel, that you laboriously posted this same inane comment on every single one of my news sites. Too late, your guys were busted by Suburban News Network. Baba Booey. What does that mean? Babba Booey? Dyer, are you saying that it is laborious to post on your three duplicative blogs?